Building a machine learning model to predict a number is a trivial exercise with today’s tools. With highly optimised models, improving the accuracy of the prediction will always be dependent on the data, and clever ways of using it. 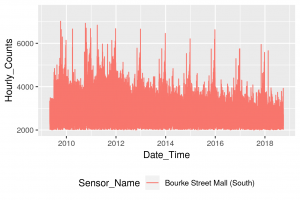 This will be the subject of this article, we’ll use R and machine learning to predict pedestrian numbers in Melbourne. adding new data to your existing data set. 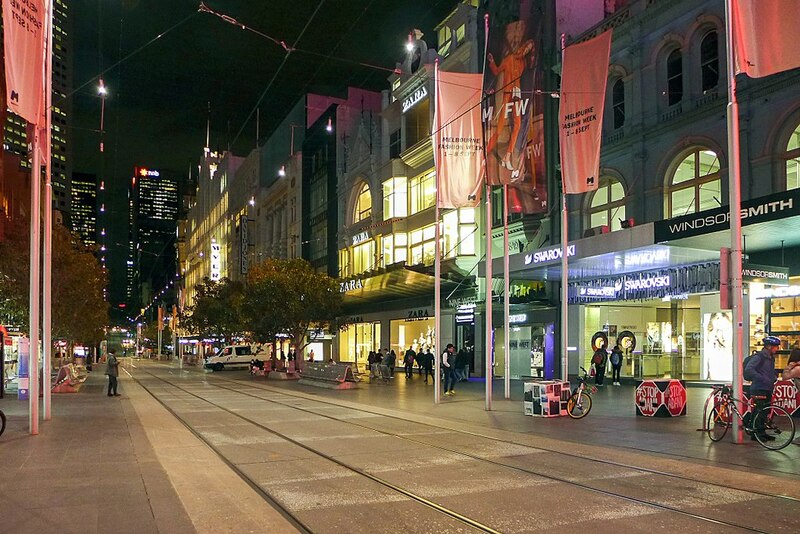 Let’s look at just one location, Bourke Street Mall (South) in Melbourne’s CBD. We can visualise this using the ggplot2 library. Interestingly, we can see a slow but steady long term decline in overall numbers, despite Melbourn’e population increasing in those years. There are strong peaks around Christmas/New Years, and secondary peaks that possibly represent school holidays. Using just this data, we can build our predictive model. Let’s try the extreme gradient boosting algorithm XGBoost, it seems to be winning the Kaggle competitions last time I checked. I find these algorithms are highly optimised with the default parameters. Feel free to play around with these if you feel otherwise. To explain the above snippet, the fourth column is Hourly_Counts i.e. the value we’re trying to predict, so it is the ‘y’ argument in h2o parlance. Now we use our test data set as input into the model we just built. Note: Your results may vary slightly due to the stochastic nature of the algorithm. This looks pretty good, the actual data in the Hourly_Counts column seem to track well with the data in our predict column. We can use the r2 metric to measure how well the model describes the data. An r2 equal to 1 means the model is perfect, an r2 equal to 0.5 means the model is no better than a guess. Let’s see if we can improve the r2 value by adding public holiday data. There is an excellent data source here that covers the date range we are interested in. Let’s take a look, the Day_In_Lieu field represents those days when a public holiday fell on a weekend, and the holiday was shifted to the following weekday. 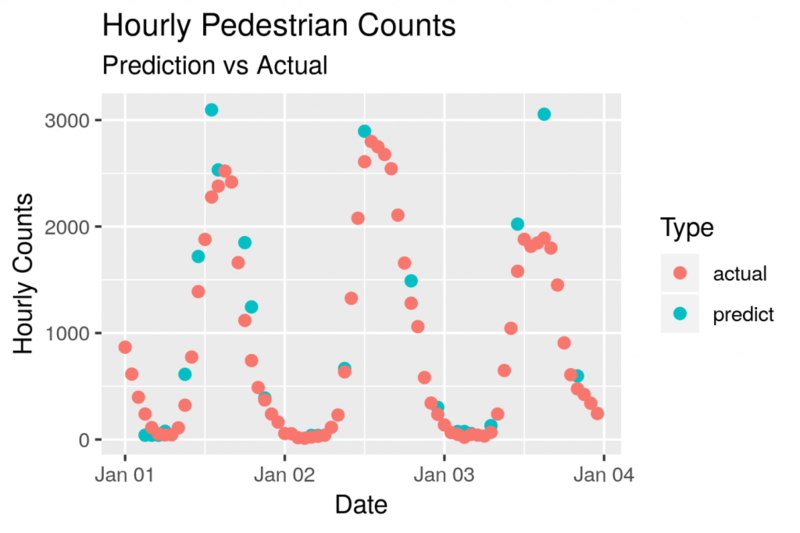 And we’ll need to join this data set with our pedestrian data, we can use the date field. Now build and test the model as before. Let’s keep it simple: Can we increase the r2 just by adding a day of week field? 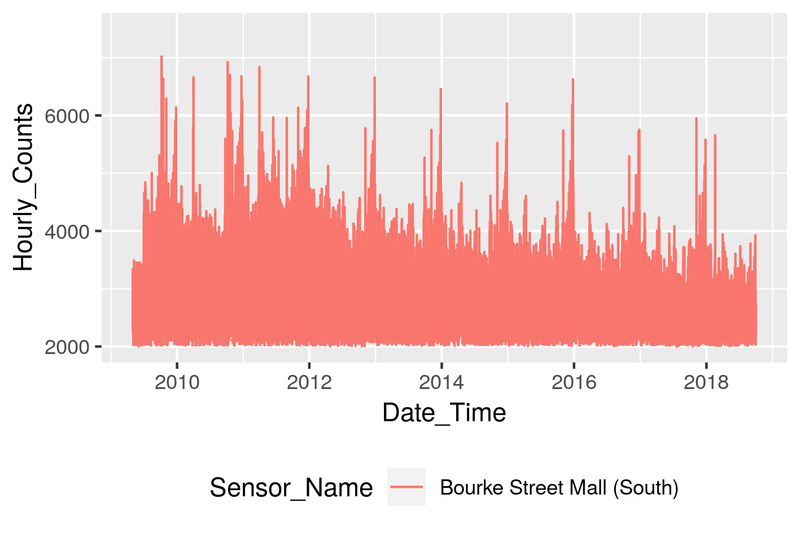 The approach described above can be applied to the other sensor locations around Melbourne. Indeed, this is a general approach that can be applied to a range of problems.